Strange as it may seem, the gray, oppressive USSR was founded on a fairy tale. It was built on the twentieth-century magic called “the planned economy,” which was going to gush forth an abundance of good things that the lands of capitalism could never match. And just for a little while, in the heady years of the late 1950s, the magic seemed to be working. Red Plenty is about that moment in history, and how it came, and how it went away; about the brief era when, under the rash leadership of Khrushchev, the Soviet Union looked forward to a future of rich communists and envious capitalists, when Moscow would out-glitter Manhattan and every Lada would be better engineered than a Porsche. It’s about the scientists who did their genuinely brilliant best to make the dream come true, to give the tyranny its happy ending. 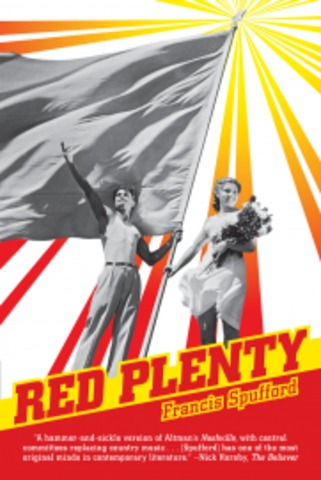 Red Plenty is history, it’s fiction, it’s as ambitious as Sputnik, as uncompromising as an Aeroflot flight attendant, and as different from what you were expecting as a glass of Soviet champagne.